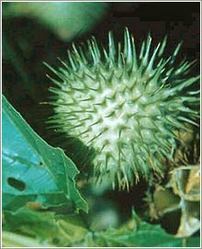 Common Name : Datura, Jimson Weed, Stink Weed, Mad Apple, Thorn Apple Stramonium, Apple Thorn, Dhatura Tatula, Datura Seeds. Part Used : Seeds, Flowers,leaves. Habitat : Common in north western himalayas and foot hills on dry slopes upto 1800 m altitude. Uses : It is narcotic, anti spasmodic, anodyne, ache reliever. Helps in relieving the spasm of the bronchitis in asthma. It is used in treatment of Parkinson’s diseases and haemorrhoids. Young fruits are sedative and intoxicating. Leaves applied after roasting are useful in relieving pain. Atropine extracted from plant dilates the pupils and is used in eye surgery. Fruit juice is applied to the scalp to treat dandruff.